Bob Wachtel is a quiet, polite, unassuming person. But over the backgammon board he consistently murders his opponents to the extent that he is now ranked the number 10 player in the world on the Giants of Backgammon list. He has won his fair share of tournaments, but what I found really impressive was his showing in the 2004 World Championships in Monte Carlo. Though he lost in the finals to Peter Hallberg, he played at an error rate of 2.6 which is pretty amazing for a long, exhausting, tension-filled final after two long weeks of competition. I think you'll find Bob's insights very interesting. I was a promising chess player as a kid growing up in New Jersey (won the New Jersey Junior three times and placed 2nd, 2nd, and 3rd in the US Junior) and would probably have tried to pursue my dreams of grand mastership had my parents not insisted that I do something more "normal." So I went to college, and then to graduate school at the University of Toronto. I emerged in 1977 with a B.S. in chemistry and a PhD (philosophy of science) but no job prospects (the academic job market was glutted with new PhDs who had used graduate studies to dodge the draft for the Vietnam war). But the backgammon fad was in full swing at the time. I learned the game from my chess buddies and soon won some of their money. I began traveling, looking for action, and eventually found my way to Los Angeles, where there was a great bridge club, the Cavendish West, which had an upscale clientele and plenty of backgammon in addition to the card games. In the last few years I have preferred European tournaments to most American ones: more exotic venues, added money, and the variety of cultures make those tournaments very attractive. But with the recent development of the USBGF, I anticipate that the American scene will become far more vibrant and exciting. I have recently become active in that organization and have great hopes for the future given the quality and dedication I have seen from the leadership. Otherwise, I like money and proposition play. I think it is a weird development that there are so few money games and chouettes at tournaments nowadays. I miss the old days, when tournaments were almost an afterthought to the money and prop action. Probably winning the 1992 Venice Olympiad, which was held on the island of Lido. I faced the Japanese expert Kazuhiro Shino in the final, and when I asked him before the match if he would like to hedge, he answered me with a sly smile: "No! Maximum pressure." Since he was quite rich, he meant, of course, maximum pressure on me! The 25-point match came down to double match point, and the last game itself was a very close one. So the feeling I had upon winning was a very happy release of "maximum pressure." Unfortunately, I was paid the first prize in Italian lira. Within a few days the lira was devalued by 25%! Tournament organizers have been too slow to bar unsavory characters, including known cheaters, from live tournaments. They (the organizers) seem to believe that they are obliged to follow some sort of "beyond a reasonable doubt" standard in barring a bad guy. But tournaments are private functions. None of us, moreover, has the forensic tools that are available to the police and prosecutors when they bring a case to a court of lawso it is ridiculous to expect other players to "prove" in the same way one would in a murder trial that there has been foul play in the backgammon world. After a while it becomes obvious that certain people are the locus of unpleasant incidents. I think it's not hard nowadays to improve. The tools at your disposal are excellent, and if you are just the least bit organized you should be able to make progress quickly. Beyond that, it's just a matter of enjoying the game enough to keep working at it. Not very well. I am not a good traveler (a bit disorganized, and I suffer from jet lag), and sometimes I burn myself out by playing too much before big events. Like a tennis player, you should be able to peak for the majors. I believe I will go to a few Euro tournaments later in the fall. I have my eye on Mallorca and Paris (October) and Cyprus in December. Tell us about the backgammon book you wrote. Is the information still valid today? The book was called In The Game Until The End. It was written in 1992, which was a year or two before Jellyfish came out. The positions ("stay or go" contact positions as the last residue of an ace-point game) were worked out entirely with hand rollouts and math. There was a program out at the time called Expert Backgammon, but it was useless. I mentioned some of its results in the book only to discard them. I recently reviewed the conclusions that I reached in the book through Extreme Gammon (XG) rollouts and they are remarkably accurate. No modifications required! I was going to write a sequel and in fact did a huge amount of work on it in 93-94. But when Jellyfish came out, it seemed to me that my grand plan of working backgammon out chess-style, starting with the simplest endgames and getting more complex from there, would be too trivial for anybody to do. So all of my ingenuity and work had become irrelevant. Which it still is, but since nobody else has bothered, I may get back to "Son of Ace Point" in a while and publish the results. Nothing but marketing. And that marketing does not need to be particularly inventive or ingenious. The game itself is so intrinsically enjoyable that you just need to expose people to it in a non-threatening way. You might call my philosophy of life semi-Eastern. I am a stress-avoider. I dodge deadlines, dramas, and situations where I can conceivably be blamed for others' unhappiness. In consequence I have not gotten rich, married, divorced, or fathered children. I am an dogmatic atheist. Politically I'm an anti-tribalist, meaning that I see no merit in the ethnic and nationalistic modes of self-identification that so fascinate the average person and are still so maddeningly rife throughout the world. I'm an avid tennis player. I take lessons and have reached a decent club level (4.0 to 4.5). I've always enjoyed racquet sports, but it's really hard to make up for not having taken lessons as a kid. There's no substitute for the technique that comes as second nature to you if you are taught the right way from the start. There's an analogy here to backgammon: quite a few players from the pre-bot era have a hard time unlearning the false principles they adopted when they did not know any better, while the younger players who were bot-trained from the start don't have that hurdle to jump. I've pursued a number of careers. After abandoning academia, I gambled for a few years, then traded options on the floor of the Philadelphia Stock Exchange for five more (I won and lost a few small fortunes, came out even), then wrote a backgammon book ("In the Game Until the End"), then spent a year developing a unique food snack. Starting in 1995 I devoted almost ten years to the Sherlock-Holmes type unraveling of the scandal surrounding the death of the famous "tobacco heiress," Doris Duke. My solution to that mystery resulted in a monumental book (title: "An Overdose of Greed"), which I was, sadly, unable to get published. Nowadays I do some writing, some gambling and some stock market investing. I have lived in Southern California for about 30 years now. I love the weather here, but who knows what the future has in store? I'm open to change. Tell us something about your youth, where you grew up, where you went to school, your family, where you live now, what are your plans for the future, your age? I am 62. My parents were Jews who fled with their parents from Germany and Austria just before Hitler gained total control in those countries. They met in New York City, married, and I was born at the beginning of the baby boom. We moved to the suburbs of New Jersey, where I grew up. I had no idea what to do with my life so I stayed in school till I was 28. No contest. Mike Svobodny: great player, great money maker, and the most generous person I've ever met. Get nostalgic with us. 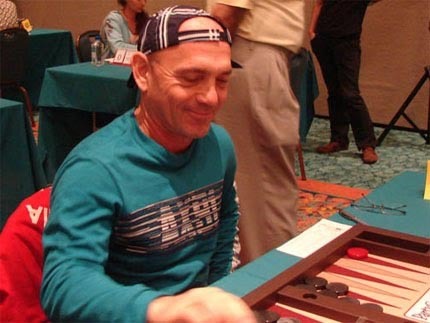 What do you miss about the "good old days" of backgammon 20 years ago or so? The action and the mystery. In that pre-bot era, with no authorities to rely upon, almost everybody overestimated their own strength. This led to fantastic action. You could play a single prop for weeks, and the same went for head-on matchups. They went on until one of the parties was broke. By mystery I mean that there were lots of questions, quite technical ones even, that nobody knew the answer to. Comparing the intellectual aspect of the game then to what it has now become is like the difference between reading a story that that you know the ending to and one that you don't, or perhaps like reading a novel and reading the Cliff's Notes to it. Nowadays there is no suspense, and no pleasure in the adventure of getting to your answer. You just look it up, or at worst, roll it out. Your (Phil's) "random-gammon" idea sounds like Nackgammon on steroids. It is not unlike a lot of different backgammon variants that Kumar Motakassis and Jim Pasko used to come up with in the old days, although they often changed not just the starting position, but the rules themselves! Yes. On Play65 and its skins, PrimeBackgammon and GammonEmpire, where I have a 2000 rating. Also on TrueMoneyGames (TMG). Tournaments nowadays have become too tedious. Because nobody plays side action any more, all of the tournament entrants want to be kept busy for the duration. Which leads to double eliminations and interminable consolation flights with scores of people playing match after match in a grand struggle to re-enter the main flight. My ideal tournament would just have one match a day, Monte Carlo-style, and a simple consolation tournament, both single-elimination. Other than that, a great tournament would have to be held somewhere warm and exotic. Playing rooms would have to be open 24/7, with room service available all day and night as well.